Before you can finalize your decor, attire, and flowers, you'll need to pinpoint your wedding aesthetic. Here's how to do it. Once you’ve finalized your wedding date and venue, it’s time to define your wedding aesthetic. Maybe you already know how you want your wedding to look, because you’ve spent the last several months (or years...no judgment) hoarding ideas in preparation for this exact moment. In that case, go you! 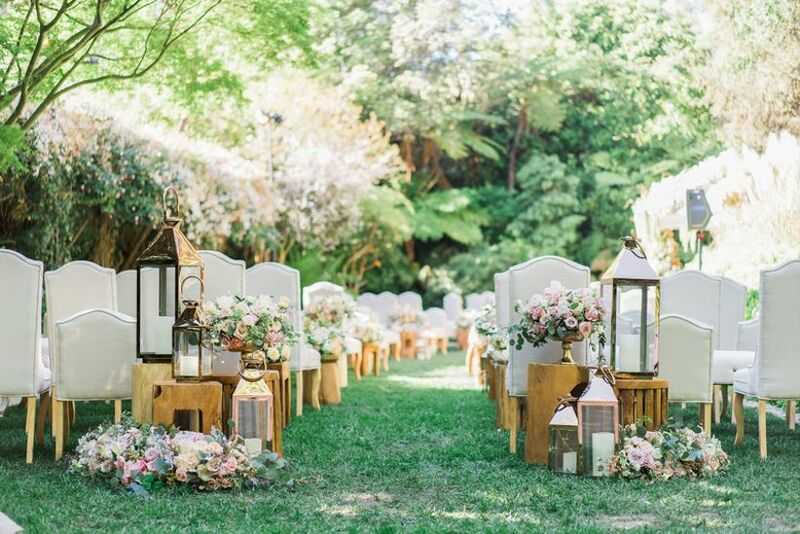 On the other hand, if you’re struggling to spot the immediate difference between rustic and classic styles, a quick wedding aesthetic refresher might be in order. Either way, we’re sharing a few foolproof tips to ensure that you’re on the right track! Here's exactly how to find your wedding aesthetic. Your wedding aesthetic is essentially your wedding style. 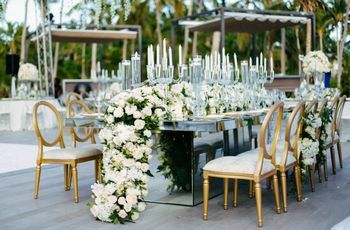 It represents the overall look or feeling you want to create on your wedding day, from the setting, attire, and color palette to the tiniest details like flatware and place cards. Examples include basic styles, like classic, bohemian, rustic, glamorous, beachy, or vintage. 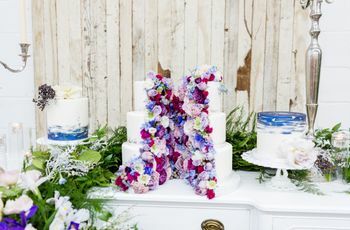 But instead of being tied to one specific style, your aesthetic could also be more vague — for example, “snowy winter wonderland” or “relaxed summertime get-together.” Your wedding aesthetic could even draw inspiration from something super-specific, like the opulence of Marie Antoinette’s bedroom at Versailles, an enchanted forest wedding, or the mismatched decor and whimsical vibes from Mamma Mia (both movies — don't ask us to pick a favorite). One of the key steps in creating a flawless wedding aesthetic is ensuring that everything is cohesive and carefully planned out. 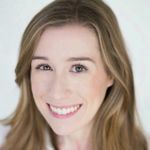 If you've ever seen a perfectly curated Instagram profile, the photos probably stick to an overall color palette and have an overarching theme to them, even if it's not obvious right away. That's an aesthetic! It doesn't happen on its own, but the end result is worth it. The sooner you define your wedding aesthetic, the sooner you can begin finalizing all of the other details for your big day (see a list of everything you’ll need to do here). 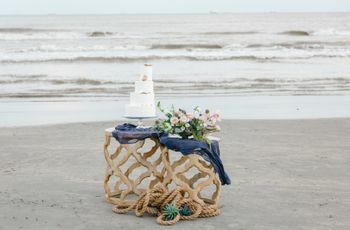 Last but not least, your wedding aesthetic serves as a guideline for your vendors as they’re bringing your vision to life, so it’s important to establish it clearly from the start. Most importantly, you’ll want to be sure that your wedding aesthetic complements your venue. Consider the location where you’re getting married. Is it a loft in the city, a barn in the countryside, a resort on the beach? Take note of any prominent colors and existing decor at your venue, then think about how to incorporate those details into your overall wedding aesthetic. For example, a fancy ballroom with ceilings and checkerboard tile floors is better suited for a formal wedding aesthetic rather than a trendy tropical theme. Next, think about the season in which you’re marrying. 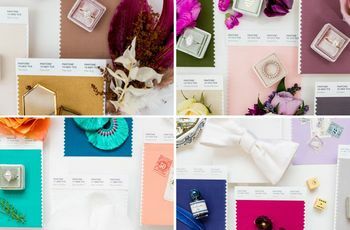 While your overall wedding aesthetic doesn’t totally have to be influenced by the season, the time of year can help you determine smaller details, such as your color palette, attire, and even your menu choices. Your wedding season can also affect things like your decor and flower arrangements, which are important components of any wedding aesthetic. Your wedding aesthetic should be an extension of your everyday style. It’s the best way to stay true to yourself and avoid the dreaded “What were we thinking? !” conversation years down the line. If you and your S.O. are always ready to jump on board with the latest trends, it’s only natural that your wedding incorporates the coolest of-the-moment details. But if you tend to be more reserved or traditional in your daily life, stick to a wedding aesthetic that captures what you really love — and will still love in a few decades. To get a good sense of the styles you naturally gravitate toward, take a close look at your home decor and your closet. Stepping back and intentionally looking for similarities throughout your house might surprise you. Is there a particular shade of green that seems to pop up in every room? Did you subconsciously add rustic farmhouse accents when no one was looking? Are you drawn to bold patterns, or do you gravitate toward clean lines and neutral colors? Write down a few words or create a mood board describing your everyday style, and then start thinking about how to translate that vision into your wedding. 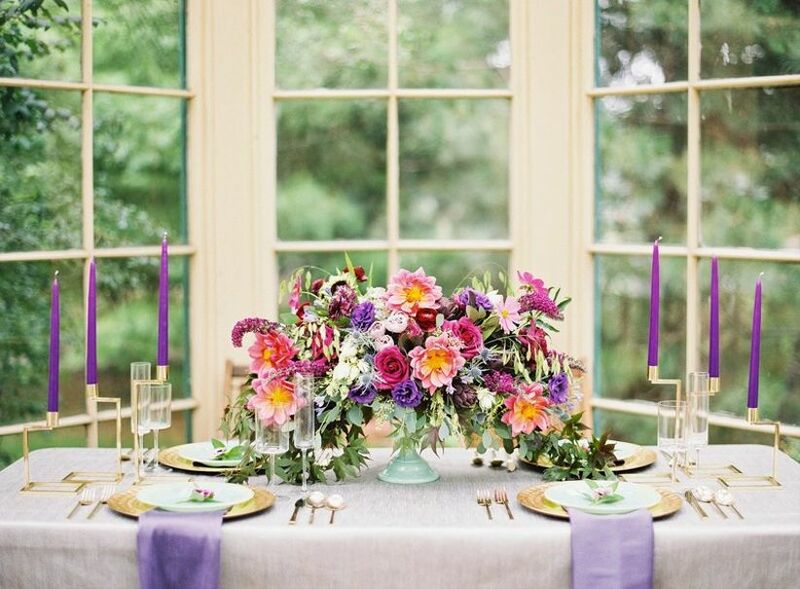 Identify a few decorative accents you absolutely love and use them as a foundation for your wedding aesthetic. Maybe it’s something that you saw at a friend’s wedding, like an ultra-modern acrylic calligraphy sign, or a collection of chinoiserie vases from an antique store. Sometimes, it's easier to choose your statement items first and then work your way backwards to define your specific theme or aesthetic.